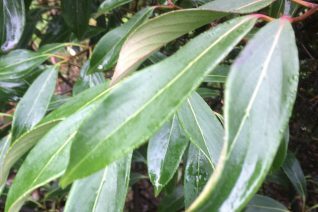 Unusual and actually superior form of this species with large glossy evergreen leaves splashed with yellow. 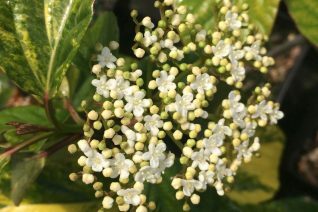 In spring flat corymbs of flowers appear and remind me of lace. Red berries follow but are consumed by birds. This form is not prone to mildew which can afflict the green leaved form. So, we love it for it’s bold leaves that look good year round and easy demeanor. To 8′ x 8′ in 10 years. Full sun to quite a bit of shade. Doesn’t burn in sun. Adaptable. Light summer water once established. Very old specimens get by with no summer water. Excellent year round appearance. Take out green reversions if they occur. Blooms on wood from the previous season- prune if needed after flowering. Specimen. Nice shrub. Really there is nothing like the clove/carnation/sweet fragrance of this shrub in late winter to early spring. 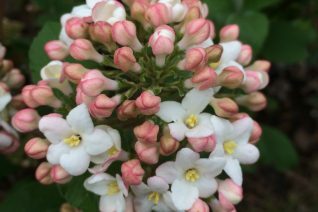 The large clusters of flowers begin as pink buds and open to white. Nice bicolor effect along the way. Blooms 3-4 weeks. Evergreen to semi-evergreen to deciduous in arctic places. 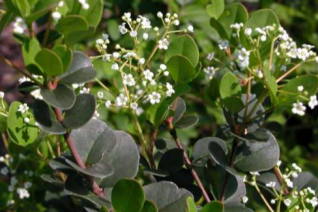 Large growing shrub that can attain tree like proportions with great age. To 8′ x 4′ in 7 years. Full sun to quite a bit of shade in rich to average well drained sites. Light consistent summer water speeds growth and increases spring flowering. Otherwise relatively drought adapted, especially in shade. Tolerate the most obnoxious sticky clay soils- especially on slopes. Plant where you can pass by the flowers and take a big ol whiff. Very easy to grow. Prune AFTER flowering. Unique and we think very pretty evergreen Viburnum. 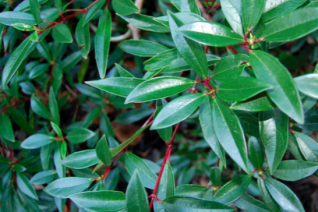 Small perfectly round leaves are placed in threes around the stems. In summer the terminal branches host clouds, or cymes I should say of tiny white flowers. They have no fragrance but are pretty to look at.. Moderately growing rounded shrub of great symmetry to 4′ x 6′ in 7 years. Full sun to part shade in rich, well drained soil with light but consistent summer moisture. Takes very dry conditions when established. 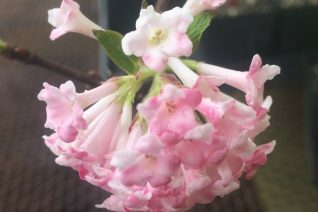 At first glance this does not look like a Viburnum- which is charming. Its a very pretty dense growing first rate evergreen.